Amazon supposedly released Kindle Touch (KT) 8 days earlier than the promised release date but my order was still showing November 23rd, 2011 as delivery date. I just can’t wait that long to get my hands on it so I went by Best Buy to pick up a KT. Best Buy only had KT with special offers and I was a bit reluctant on getting the KT w/ SO. I was still a hesitant on getting the KT at Best Buy because of the special offers but they told me I can turn off the special offers feature once I register the item to my account and pay $40 price difference to turn that feature off and indeed, they were right. I am going to try it out with the special offers and see how much they bugged me or tempted me to spend more money. The new Kindle Touch doesn’t feel much different in terms of reading to me compared to the Kindle Keyboard except the size and weight. I am still getting used to the menu structure and the touch area to get the menu to show up and turn pages. 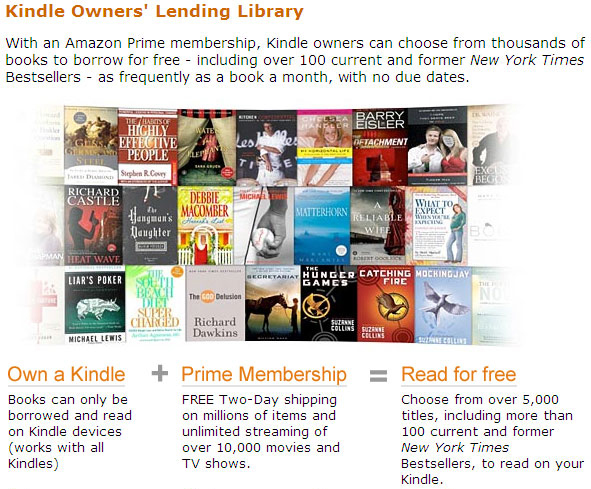 There are two features which pushed me on getting KT were the new Kindle Owner’s Lending Library and public library lending. Even without the new release of Kindle, I would never go back to the way of holding physical book. Reading either on the new KT or my iPhone was way too convenient.